Responding to Pakistan Prime Minister Imran Khan’s statement that India and Pakistan have better chance of settling Kashmir issue only if the Bharatiya Janata Party (BJP) wins, the defence minister termed it as an election gimmick. She said, “Such statements come around elections in India&also there have been eminent Congress leaders who've gone there to seek help 'Modi hatane ke liye madad karo business.” Nirmala Sitharaman Doubts Imran Khan’s Promise Post Pulwama Strike, Asks What Steps Pakistan Took After India Sent Dossiers on 26/11 Mumbai Terror Attacks. 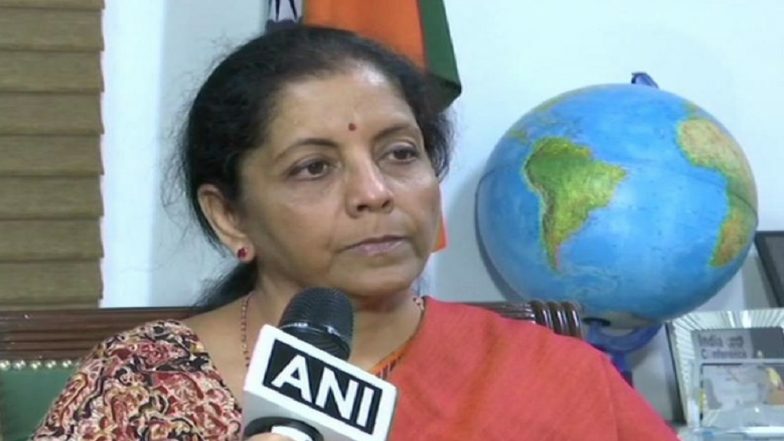 Reacting to the letter written by armed forces veteran against politicising defence forces, Sitharaman said that because of political will, strong actions could have been possible. She stated, “We don't want to politicise but if because of political will some actions have been taken up and some actions became possible now, does that mean governments never speak about what decisions they take?” The Defence Minister further added, “After all credible professional force does its job dispassionately, I fully concede that. But without political will, without freedom to act when they think fit, would it have been possible?” Defence Minister Nirmala Sitharaman Lauds HAL-Built Tejas, Says 'Indian Aircraft Better Than China-Pakistan's JF-17'.